Buckle up, NASCAR fans — the Monster Energy NASCAR Cup Series Awards are headed to Music City. Nashville is the new host city for Champion’s Week and the Monster Energy NASCAR Cup Series Awards, the annual postseason celebration that sees drivers, industry luminaries and celebrities alike strut the red carpet and formally crown the series champion. 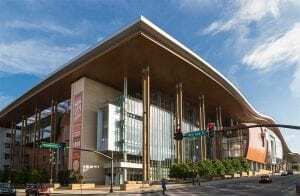 The Awards will be held Thursday, Dec. 5, at the Music City Center in downtown Nashville. Other Champion’s Week events will be announced at a later date, but fans should expect to have more access at the Awards than ever before. The formal postseason Awards is a tradition that stretches back to 1981, when the event was held in New York City. It relocated to Las Vegas in 2009 and will now call Nashville its home for 2019. NASCAR and Nashville have a history, too. Fairgrounds Speedway in Nashville hosted 42 Monster Energy Series races from 1958-1984, with the circuit visiting twice a year from 1973-84. Tennessee native Darrell Waltrip made the venue his own personal playground, winning eight races there — including four in a row from 1981-83, and five of the last seven Cup races held there. Nashville also hosted what is now the Local Series Awards for a number of years. Additionally, dates for the NASCAR Xfinity Series, NASCAR Gander Outdoors Truck Series and NASCAR Regional, International and Local Awards will shift and be held before the Monster Energy Series Awards. Once again held at the Convention Center in Charlotte, North Carolina, the 2019 Xfinity Series and Gander Outdoors Truck Series Awards are Friday, Nov. 22, following by the Regional, International and Local Awards on Nov. 23. Those events will be held the week after the NASCAR national series crown three champions in Miami, but before Thanksgiving.